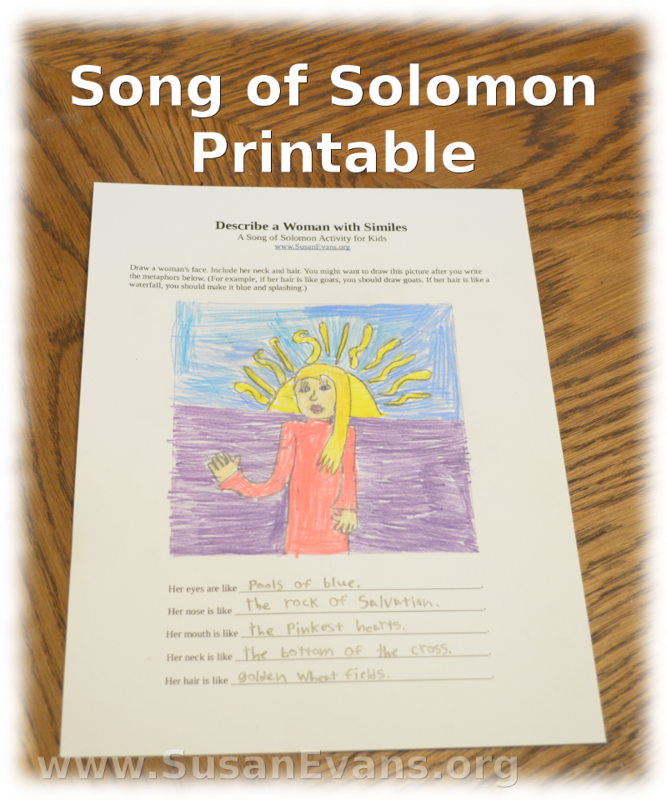 I believe the whole counsel of God should be taught to children, so I made up this Song of Solomon activity for kids, where they can compare the face of a woman to various objects. My daughter made lovely comparisons while my sons wrote hilarious descriptions that were more like insults. If you’ve ever read the book of Song of Solomon, some of Solomon’s comparisons seem insulting as well, causing my children to laugh with uproarious laughter. My daughter said that her eyes were like pools of blue, her nose was like the rock of salvation, her mouth was like the pinkest hearts, her neck was like the bottom of the cross, and her hair was like golden wheat fields. One of my sons said that the woman’s eyes were like tornadoes, her nose was like a two-car garage, her mouth was like a banana, her neck was like a redwood, and her hair was like poppies. He laughed hysterically as he drew what he had just written. Another one of my sons said the woman had eyes that were pools of blue, a nose that was a lump on her face, a mouth that was like jaws of death, a neck that was a pillar, and hair that was… um… brown hair. Apparently he copped out on that one and couldn’t think of anything. You see, if her hair is a flock of goats, you need to actually draw a flock of goats coming out of her head. This is why this Song of Solomon activity is so much fun. Sign up below for a free Bible crafts e-book! 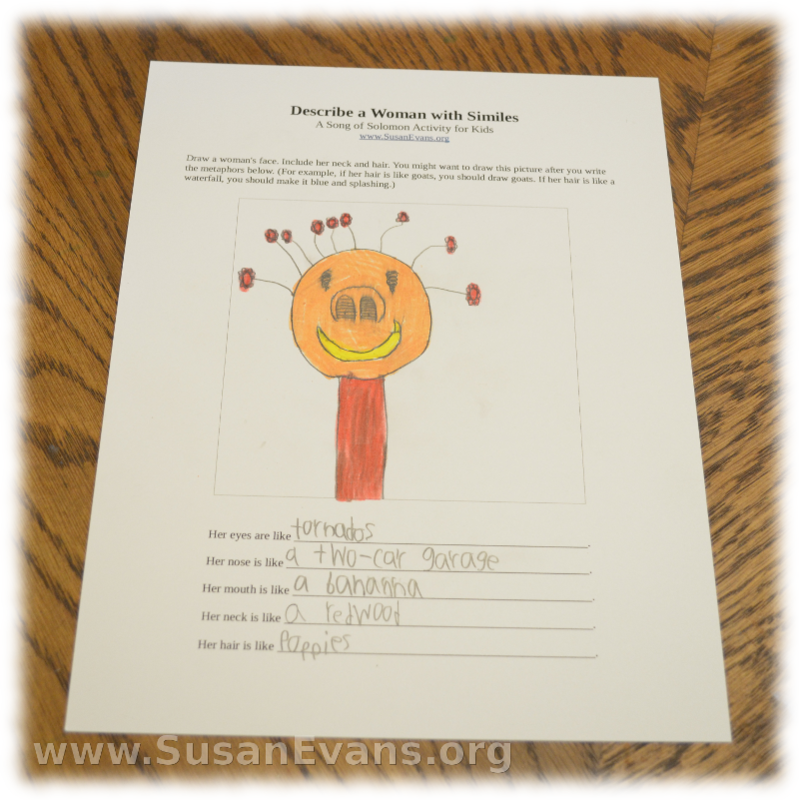 If you enjoyed this activity, you will love all the hands-on activities inside the Unit Study Treasure Vault. Why not join today! This entry was posted on Friday, September 5th, 2014 at 8:00 am	and is filed under Bible. You can follow any responses to this entry through the RSS 2.0 feed. You can skip to the end and leave a response. Pinging is currently not allowed. Two-car garage made me laugh, too! What a neat idea. 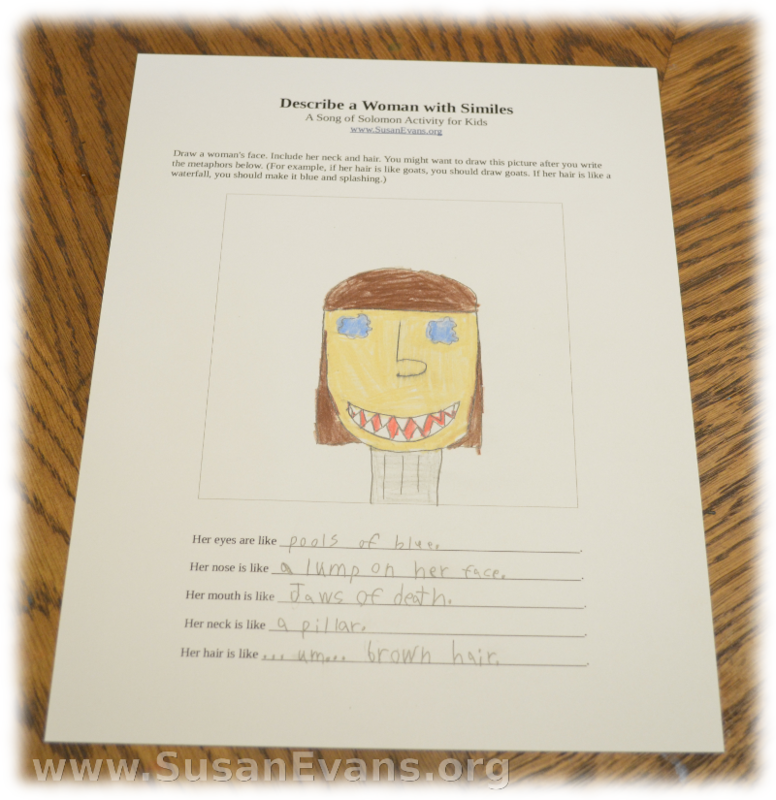 I love how your son depicted the woman – so funny! The kids had fun with this! How have I missed this lesson on your blog before this? Hahaha! Well, now you’ve seen it. There are so few children’s lessons on the Song of Solomon.